Whether you are saving for a particular purpose, trying to establish an emergency fund or seeking to build a nest egg, there are many different ways to approach saving money. Start with a few techniques and add more as you start to get in the habit of setting aside money for later use. If you're at a loss when it comes to finding strategies to save money, simply shift a few habits and watch the money pile up. Save an hour's pay: If you make $10 an hour, save one hour's pay per week. Right away, you've saved $40 for the month. Add more hours or days as your budget allows. Automatic savings deposits: Have the amount you decide to put away direct deposited into your savings account as soon as you get paid, so you don't miss the money. Start a change jar: This was easy to do as a kid, and many adults and families still consider this method as a painless way to save without sacrifice. Defer the raise: The next time you receive a pay raise, divert the additional funds to your savings account instead of upping your spending to offset the increase. Avoiding debt is the easiest way to save money. Nothing is worth buying if you pay more for it through credit card debt. It's irrelevant that you found a cheap big screen TV on sale if you bought it on credit and have to pay a monthly finance charge; you end up paying more than the sticker price for that "bargain" purchase. Manage credit card debt more effectively: Instead of making minimum payments to each card, systematically pay off card balances. With each balance paid off, increase monthly payments on other high-interest credit cards until they are all paid off. Reduce loan terms: Add extra to your car payment or house payment to enjoy significant interest savings and pay off the debt early. Get a debt consolidation loan: If you are carrying a number of high interest credit cards and other debts, a consolidation loan may be a good solution to pay it down quickly. Make payments on time: Take care of your bills on time to keep from throwing away money on late fees and unnecessary interest charges. Get help if necessary: Gain a better understanding of debt management and reduction with advice from a credit counselor. It's important to keep track of what and why you spend and learn to live within your means. If your desire has shifted from immediate acquisition to a long-term building of wealth, checking your spending should be easy. Write down all purchases: Track what you spend so you are aware of where your money is going, and decide if it's worth it. Establish a budget: Once you know where your money is going, you can create a budget that includes set amounts for bills, food, entertainment, transportation, savings and more. Stick to your budget: Keep track of purchases and expenditures and do not spend more than you have budgeted to make sure that you aren't wasting money and are living within your means. Use coupons: Using coupons on everyday purchases is like getting free money to put toward purchasing things you'd buy anyway. Consider reasons for spending: Do you shop when stressed? Out with friends? Because you feel you deserve it? If you have that type of emotional attachment to money, gain a better understanding of what really needs to be satisfied. Once you've established minor saving habits and better spending skills, you're ready to advance to stronger strategies to save money. Financial advisor Jesse Brown suggests the following steps for paying yourself first. Adjust your accounting methods: Round up every checking account entry to the nearest dollar, which "pads" your accounts with money that you don't record. Establish an emergency fund: Save at least three-to-six months worth of salary in a savings account or money market fund so you will be able to handle any problems that might arise. Company retirement contributions: If your company offers a 401(k) or other tax deferred retirement plan, take advantage of it. You'll benefit from company matching (if available) and a reduction in taxable income. 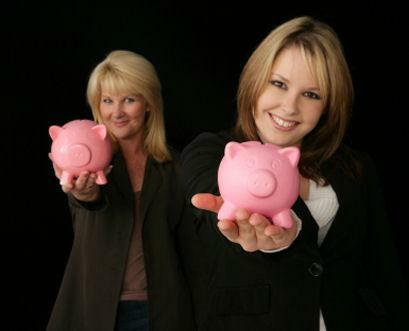 Consult a certified financial planner: There's a difference between saving and investing. Make sure your primary savings needs are met before thinking long-term. A financial planner will help you design money solutions that go beyond pinching pennies and help you build wealth. While thinking about and implementing a plan to begin saving for your future may seem like an overwhelming task, it is nevertheless a task which will -literally and figuratively- pay off in the future. It's comforting to know that your future retirement is being cared for or that you will have security should you encounter a rainy day. Surprisingly, once you begin saving, it becomes like a habit and in the long run you'll hardly remember the time when you didn't sock a few dollars away in anticipation of your future.